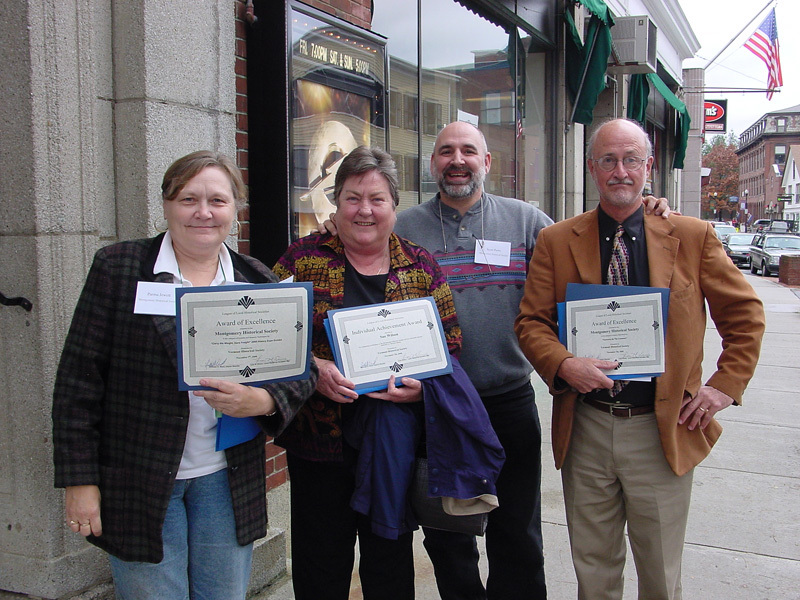 L to R: Parma Jewett, Sue Wilson, Scott Perry, and Steve Hays with their Vermont Historical Society - League Of Local Historical Societies Awards. The Montgomery Historical Society repeated last year's success with three more annual awards for excellence. The Montgomery Historical Society received three awards for excellence at the joint Annual Meeting of the Vermont Museum and Gallery Alliance, and Vermont League of Local Historical Societies on November 7th in Bellows Falls. One was in recognition of Individual Achievement, one for its VT History Exhibit, and one for Society Operations. Sue Wilson was recognized for Excellence in Individual Achievement for her work as Society Treasurer and Financial Advisor, a position she's held for over 12 years, and which includes complete management of all financial assets of the Society. She processes all expenses and revenues, and invests funds to generate as much interest income as possible, while maintaining enough liquidity to meet all of the Society's financial obligations. The Society's VT History Expo exhibit received an award for Excellence in Exhibits and Museum Techniques. This exhibit documented the innovation claimed by the Atlas Plywood Corporation in the manufacture of 3-ply hardwood plywood packing cases manufactured in Montgomery by the Nelson and Hall Company in the early 1900s. It was cited for expanding the knowledge of the manufacturing process and providing a snapshot of one of the major cultural influences in Montgomery's history for the period. The award was accepted by Parma Jewett, Society Archivist and co-producer of the exhibit. The Society's "Concerts By The Common" program, directed by Steve Hays for 20 years, was singled out with an award for Excellence in Society Operations. The CBTC series was credited for helping make Pratt Hall a "living artifact", keeping people coming into the building for activities, generating membership, and fostering community involvement with local history and restoration efforts. “We are on a roll” commented Society Chairman, Scott Perry on receiving six awards in the last two years. “These awards reflect the selfless dedication of these folks to our organization and community. We are lucky to have them and very grateful for the continued generosity of our membership which makes all of this possible."